The lack of a co-ordinated US strategy to combat the flow of illegal weapons into Mexico has fuelled drug violence there, a US government watchdog says. The Government Accountability Office (GAO), in a report published on Thursday, says key US agencies have failed to work together. 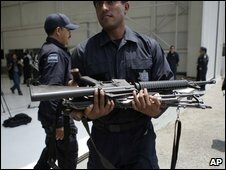 Authorities in Mexico, which has seen a jump in drug-related murders, have long urged the US to tackle arms-smuggling. Secretary of State Hillary Clinton said in March that the US should do more. The GAO report, which is due to be the subject of a congressional hearing on arms-trafficking later on Thursday, highlights key areas of failure. Individual US agencies have their own projects, the GAO report says, but "do not effectively coordinate their efforts, in part because the agencies lack clear roles and responsibilities and have been operating under an outdated interagency agreement". Two key agencies, Immigration and Customs Enforcement (ICE) and the Bureau of Alcohol, Tobacco and Firearms (ATF), have only recently increased their co-ordination with each other and with their Mexican counterparts, the GAO found. The report details, for example, how one ICE agent kept watch on a suspect, unaware that he was an undercover ATF agent. The Mexican government has long argued that Washington should do more to tackle the smuggling of weapons across the border. Mrs Clinton, during a visit to Mexico City in March, acknowledged that the US shared responsibility for the drug violence, on account of its insatiable demand for illegal drugs and its inability to stop weapons flowing south. Congressman Eliot Engel, who chairs the subcommittee holding the hearing, said the GAO report was troubling. "It is simply unacceptable that the United States not only consumes the majority of the drugs flowing from Mexico, but also arms the very cartels that contribute to the daily violence that is devastating Mexico," he said. One point contested by US gun rights groups is whether the US is actually the source for the vast majority of the illegal guns turning up in Mexico. In 2008, some 30,000 weapons were confiscated by Mexican law enforcement officials but only 7,200 were submitted to the ATF to be traced. The GAO acknowledges that there is insufficient data for a comprehensive study but concludes that the US, in particular the border states of Texas, California and Arizona, are the source of most of the weapons smuggled into Mexico. "While it is impossible to know how many firearms are illegally trafficked into Mexico in a given year, over 20,000 or around 87% of firearms seized by the Mexican authorities and traced over the past five years originated in the United States," GAO investigator Jess Ford says.